The Bookmarks dialog lets you add, edit, and delete Bookmarks. Bookmarks are saved in the network location /local/bookmarks. The bookmarks are listed in the dialog with the bookmark name in the left column, and the bookmark's path in the right column. When there are more than 20 bookmarks in the list, use the scroll bar on the right side to look through them. The dialog's titlebar can be grabbed to drag the dialog around the screen. To close the dialog, click the x button in the upper-right corner. The text fields at the top of the dialog are used to add bookmarks. Enter the name of the bookmark in the name field on the left, then enter the network path for the bookmark in the field on the right. Click the Add button to add the bookmark, it will be displayed in the list below. Bookmarks can also be added directly from the Bookmark Menu. To edit a bookmark's name or path, click directly in the field and make the change. The name or path is updated after pressing Enter or clicking in another field. 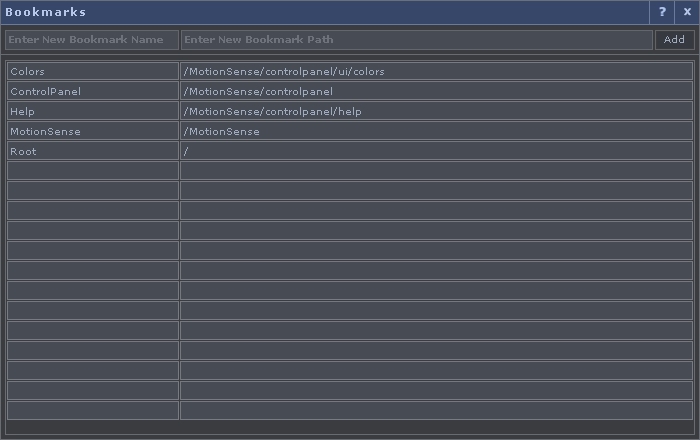 Right-click on any bookmark to open the options menu. To load a bookmark, right-click on it to open the options menu and select Load Bookmark. Bookmarks can also be loaded directly from the Bookmark Menu. To delete a bookmark, right-click on it to open the options menu and select Delete. This page was last edited on 5 October 2017, at 11:17.